As you may know, Tim and I recently purchased our first home! It has been an exciting time in our lives to say the least, and now that we have a new home, we’ve got to furnish it! It’s quite empty and echoey currently, but hey, the furniture will come in due time (and then I’ll show you a FULL HOUSE TOUR). We do have a bed to sleep on (praise the Lord!) Since we moved, we’ve both been wanting to upgrade our full-size bed to a nice, king-size bed! That hasn’t come yet, but we did find some amazing eco-friendly sheets that I could not pass up on in the mean time. I present to you - DOPLNOK, a NY based home decor startup that offers sustainably sourced organic cotton bed sheets to their online customers. Their sheets are made with 100% ORGANIC cotton of the highest quality and they feel LUXURIOUS AND SILKY. I want to give a huge thank you to DOPLNOK for sponsoring this post and gifting this amazing set of sheets to me. I was thrilled when they reached out to me and asked if I would be willing to test their product and write a review based on what I thought. After looking at their brand’s mission statement to promote sustainability and ethical manufacturing, I said, “ABSOLUTELY.” I am all about supporting fair-trade and sustainable brands. Especially when the product looks and feels this luxurious. DOPLNOK values sustainability as much as they do quality, that’s why they ship all of their sheets in this reusable woven box! When you purchase sheets from DOPLNOK, you can be confident that every worker who was involved in making your sheets was treated well and paid fairly. No slave labor or sweat-shops are used to make these sheets. You can sleep soundly, knowing you’ve made a responsible purchase and used your voice to speak up for workers everywhere. 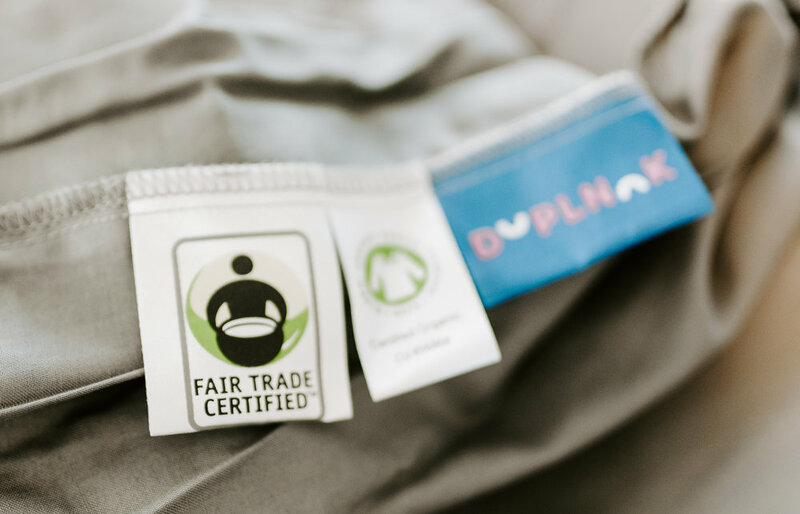 “Certified 100% Organic, no harmful chemicals, and no toxic dyes.” This is DOPLNOK’s promise. Sheet quality is important because we spend a good portion of our lives sleeping in them. That’s why I’m very picky about my sheets - I don’t want to sleep surrounded by sheets made out of cotton sprayed with pesticides, dyed and washed with toxic dyes. EEK. And then quality is a whole separate check list! I’m going to be honest, I was worried about trying out these sheets, too. What if I didn’t like them? What if they weren’t as soft as they’d promised? What if they were too heavy and made me hot while I slept? What if they were too thin? I finally breathed a sigh of relief after I had made the bed and snuggled up the sheets. They are so soft. They are light enough to keep me comfy and cozy while I sleep. They look like silk. They feel like silk. They are so luxurious, without the retail markup. I ordered the PEARL Sateen Sheet set in Moon Gray. I’m totally in love with them! Since I’m partnering up with DOPLNOK, they are offering a special 10% discount for you! Use the code “SIERRA10” during the checkout process to receive 10% off your entire order! This coupon expires October 31! Thank you, DOPLNOK, for sponsoring this post. I absolutely love your sheets!